We have previously discussed the idea that viruses originated from selfish genetic elements such as plasmids and transposons when these nucleic acids acquired structural proteins (see A plasmid on the road to becoming a virus). I want to explore in more detail the idea that the structural proteins of viruses likely originated from cell proteins (link to paper). Three ideas have emerged to explain the origin of viruses: 1. viruses evolved first on Earth, before cells, and when cells evolved, the viruses became their genetic parasites; 2. viruses are cells that lost many genes and became intracellular parasites; 3. viruses are collections of genes that escaped from cells. Missing from these hypothesis is how nucleic acids became virus particles – that is, how they acquired structural proteins. 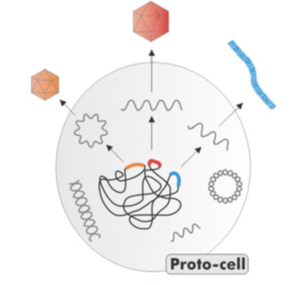 It seems likely that viral structural proteins originated from cellular genes. An analysis of the sequence an structure of major virion proteins has identified likely ancestors in cellular proteins. Following are some examples to illustrate this conclusion. A very common motif among viral capsid proteins is called the single jelly roll, made up of eight beta strands in two four-stranded sheets. Many cell proteins have jelly role motifs, and some form 60-subunit virus-like particles in cells. The extra sequences at the N-termini of viral jelly roll capsid proteins, involved in recognizing the viral genome, likely evolved after the capture of these proteins from cells. The core proteins of alphaviruses (think Semliki Forest virus) has structural similarity with chymotrypsin-like serine proteases. The viral core protein retains protease activity, needed for cleavage from a protein precursor. Retroviral structural proteins also appear to have originated from cell proteins, with clear homologies with matrix, capsid, and nucleocapsid proteins. The matrix Z proteins of arenaviruses are related to cellular RING domain proteins, and the matrix proteins of some negative strand RNA viruses are related to cellular cyclophilin. There are many more examples, providing support for the hypothesis that viruses evolved on multiple instances by recruiting different cell proteins. Given this information on the origin of viral capsid proteins, we can modify the three hypotheses for the origin of viruses into one. Self-replicating, virus like nucleic acids emerged in the pre-cellular world and from the emerged the first cells. The replicating nucleic acids entered the cells, where they replicated and became genetic parasites. At some point these genetic elements acquired structural proteins from the cells and became bona fide virus particles. As cells evolved, new viruses emerged from them. It is important to point out that the genes do not always flow from cells to viruses. 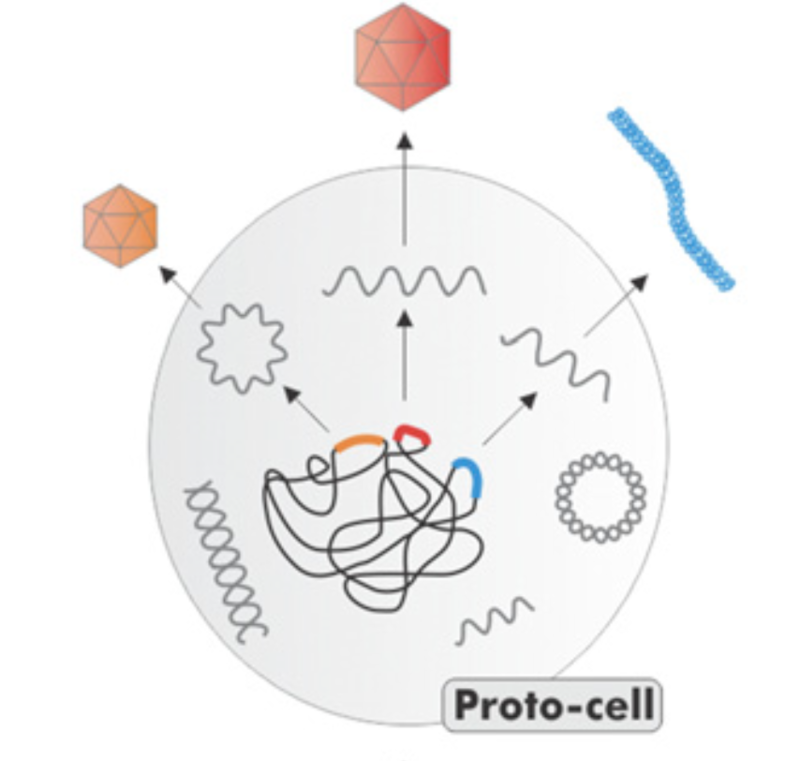 We know that viral proteins can be returned to cells, where they serve useful functions. One example is syncytin, a retroviral protein used for the construction of the mammalian placenta. There is also the phenomenon of exosomes that package nucleic acids in a membrane envelope. Those RNA nucleic acid sequences are taken up by other cells in the organism and act as signalling molecules. They are, for instance, active in senescence, acting to transform non-senescent cells to senescent status. So there is, I think a pretty good step-wise path by which viruses could evolve. Whether exosomes came first, or they are captured viruses is a reasonable question, but based on what I’ve seen in literature, I doubt they are captured. There is also the phenomenon of HAP2 – a fusion protein that is used by many different eucaryotic organisms “all over” the phylogenetic tree (from Chlamydomonas to Bees) for mediating cell-cell fusion, predominantley of gametes. Turns out, that this protein look exactly like a class II viral fusion protein. Now, the question if of course – is it of viral origin or is it a cellular protein co-opted by viruses?